When the temperatures start to turn chilly, not much feels better than soft and fluffy thermal socks that do a great job keeping your feet warm. That's why I was thrilled when the Heat Holders® team sent me a pair of their thermal socks to try. It only took a few seconds of wearing them to figure out that there is a good reason why the company promotes this product as "the warmest thermal sock." Heat Holders® offers an extensive selection of thermal socks, with styles designed for women, men and children. They are available in a variety of lengths, ranging from ankle socks to knee-length 'long' styles. For this product review, I checked out their Ladies Twist LITE™ style. These socks are extremely warm, which is exactly what you want in a thermal style. The inside of these socks is soft and fuzzy/fluffy, providing what I would describe as a soothing, comforting feel. They are just right for chilly and cold weather wear, and they do not have even the slightest hint of a scratchy feel. While I have worn them with shoes a few times, my favorite use for these socks is just to wear them around the house without shoes, in place of slippers. I am not a fan of slippers, but I also don't like cold feet. With my hardwood and split brick floors, running around the house barefoot in the winter isn't really a good option. Neither is replacing the floors with carpet, as I have three large dogs. These socks are a great alternative. My home office has hardwood floors, so I often wear these socks when I am working from home (like right now!). Whether I am sitting at the computer or curling up on the sofa with a good book or to watch TV, these socks really help ward off the unpleasantness of chilly feet. These socks are fairly thick, which is actually what I love about them. If you plan to wear them with shoes, you may need to purchase shoes slightly larger than what you ordinarily wear. Instead of doing that, I will be purchasing a pair of their Ultra Lite™ style to wear with shoes. This style is a bit lighter-weight, and so they are better suited to wear with hiking boots and shoes purchased to fit properly when wearing traditional socks. These are not the first thermal socks I have tried, but they are (by far!) the best ones I have worn. 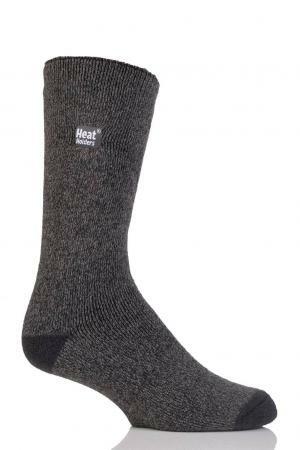 I am not the only one who thinks so - even Snowshoe Magazine brags about the quality and warmth of these thermal socks. Due to a unique manufacturing process, these socks really are different - and warmer - than other products that purport to provide thermal warmth. They are manufactured using a multi-stage process that produces unique material that holds in a significant amount of warm air. This process involves "incorporating a high-quality acrylic yarn mix with an incredibly soft, cashmere-like feel, a special long looped pile and finally an intense brushing process." Thermal socks aren't the only Heat Holders® item you may want to check out if you are looking for ways to stay warm this winter. I recently reviewed their Thermal Oversized Throw/Blanket, which is a perfect choice for keeping warm all over on chilly winter evenings. Their thermal underwear are also great for keeping warm during outdoor activities. I often wear them during hiking, kayaking and motorcycle riding adventures. They also have a nice selection of hats and gloves. I have not yet tried them, but look forward to doing so in the future! Note: The author received a few Heat Holders products at no cost for this independent product review. The opinions are those of the author.